Thank you for your interest in the farm work program! sufficient basic knowledge of English to understand directions and safety instructions. 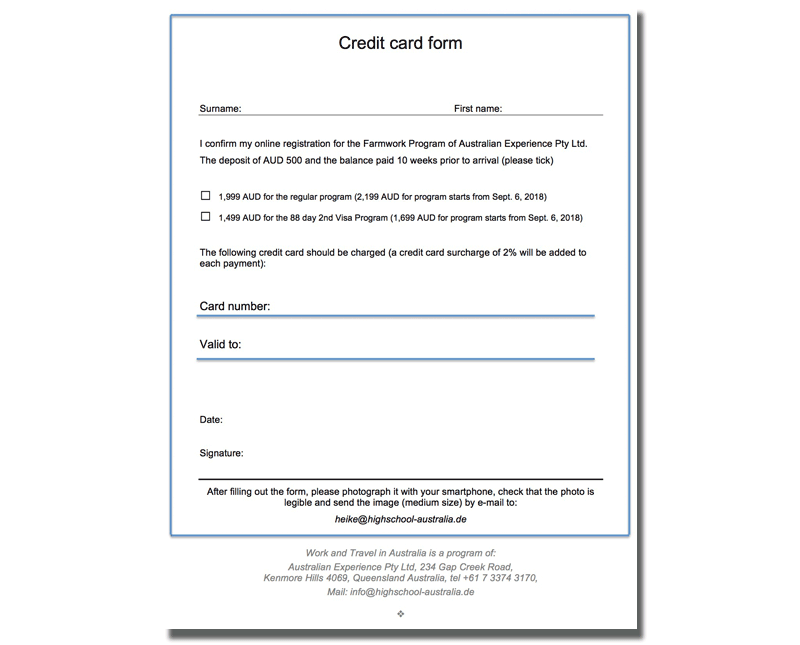 the following credit card form with signature. As soon as we have received a (smartphone) photo of it, your registration is binding. We will check that the program is suitable for you, clarify the availability of your desired start date and debit the credit card with the deposit of AUD 500. The training farm then asks that you to fill out a more detailed online form, which, in addition to the details necessary for registration, will also inform the type of job offers that you will receive during training. You will also need to upload some other documents such as a short CV, a portrait photo and a copy of your passport (picture page). * Do you have a license for manual transmissions? I know that my application will only become binding once I have filled out, signed and sent the adjacent credit card form. Mandatory fields are marked with *.